This cake is crazy chocolate good. 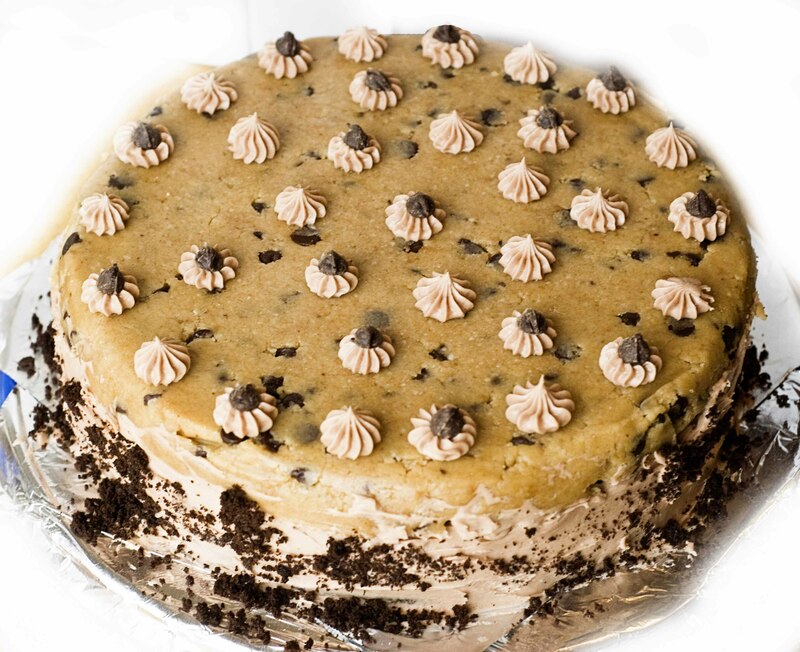 You could even just make the chocolate chip cookie dough part as a raw cookie dough substitute. Roll it into balls instead of putting it on the cake or just eat it out of the bowl. Plan to make this at least 2-3 days ahead of time to allow for freezing. It took a while to thaw as well, but at room temperature only 4-5 hours. At room temperature, the dough may sweat a little. I normally freeze cakes anyway. But, you could make this all in one day. It is possible! One of my friends did just that. Even if you don’t want to make this monster cake some of the components are great on there own like the crustless cheesecake or light chocolate buttercream frosting that you can use in other applications. 1. Turn oven to 350 degrees. Use a 9″ springform pan for all three parts of the cake to get all the parts the same size. Spray with Baker’s Joy or grease and flour. I also used a circle of parchment paper on the bottom and greased/sprayed it, too. 2. In a small bowl, put in the bittersweet chocolate and cocoa powder. 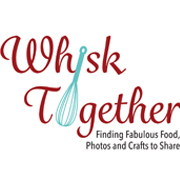 Pour hot coffee on top to melt the chocolate and whisk until combined. 3. In a medium bowl, whisk together the egg, egg yolk, sour cream and vanilla. Then take half of the chocolate coffee mixture and whisk that into this egg mixture. 4. In a large mixer bowl, stir together the flour, brown sugar, baking soda and salt. Put in the butter and the leftover chocolate mixture (no egg in it). Mix for 30 seconds on low then kick it up to medium for 30 seconds. 5. Scrape the sides of the mixer to make sure everything is mixed in. Turn off your mixer and add half of the chocolate egg mix. Beat on low and on medium for 30 seconds. Turn off the mixer again and put the rest of the chocolate egg mixture in. Beat on low and then medium for 45 seconds. 6. Pour the batter into the pan and bake 30-40 minutes. After the cake cools on a rack for 10 minutes, you can remove the sides of the pan or just leave them on until the whole cake cools. Wrap in plastic wrap and freeze if not using immediately. 1. Preheat oven 325 degrees. Grease the 9″ springform pan just like before: spray with baker’s spray or grease and add parchment circle to the bottom. 2. In a large mixer, combine the butter and sugar. Add the cream cheese a little at a time. Scrape the bowl and beat slowly until smooth. It is a cheesecake – you are not looking for airy and fluffy but smooth and creamy. Keep it slow. 3. Add the remaining ingredients: eggs, pudding, vanilla and baking powder. Beat on low for 30 seconds. Scrape the bowl and make sure it all mixed. Beat again on medium-low until all incorporated. 4. Pour batter into pan and bake 55-60 minutes. It will be golden brown on top. No worries. Allow to cool completely and wrap with plastic wrap and freeze if not using immediately. 1. Create another parchment paper circle for the springform pan (just trace and cut) and put into the 9″ pan. 2. In a large bowl, pour in the flour, salt and sugars. Stir that up. Add the melted butter and vanilla. Stir on the lowest speed or by hand. 3. Add chocolate chips. Finally, put the milk in just 1 tablespoon at a time. 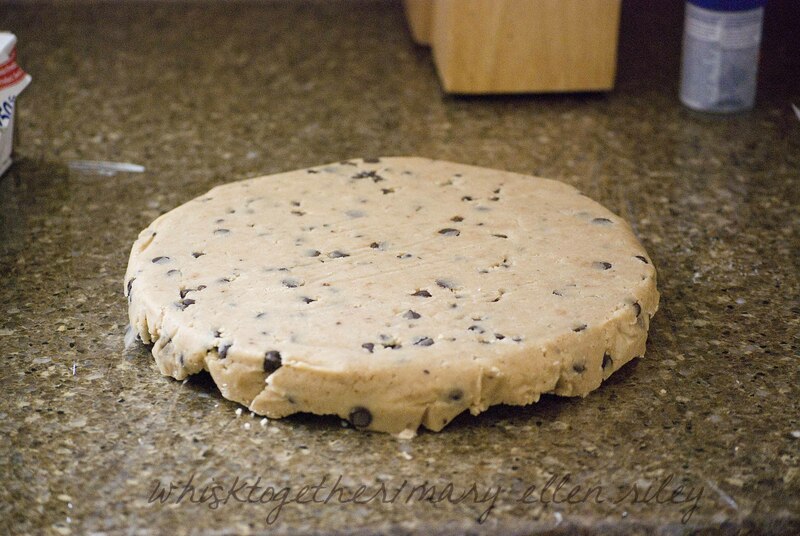 When it is all combined, press the dough into the pan evenly. Don’t worry about bumps, it will be flat on the bottom and that is what everyone will see. Wrap and freeze if not using immediately. 1. In large mixing bowl, beat the butter, powdered sugar and cocoa powder together. Once combined, add the vanilla and salt. 2. Add the milk and beat 30 seconds. Scrape the sides of the bowl to make sure all the sugar is incorporated. Then increase the speed to medium-high for 1-2 minutes until lighter in color and fluffy. Store in the fridge or freezer. As with most cakes, the frosting and construction is easier with frozen components and then let the entire cake thaw in the fridge overnight. 1. Level the cake with a large serrated knife. Keep the crumbs for later! 2. Add about 1/4 cup or frosting on top and smooth it out. 3. Put the cheesecake on top. 4. 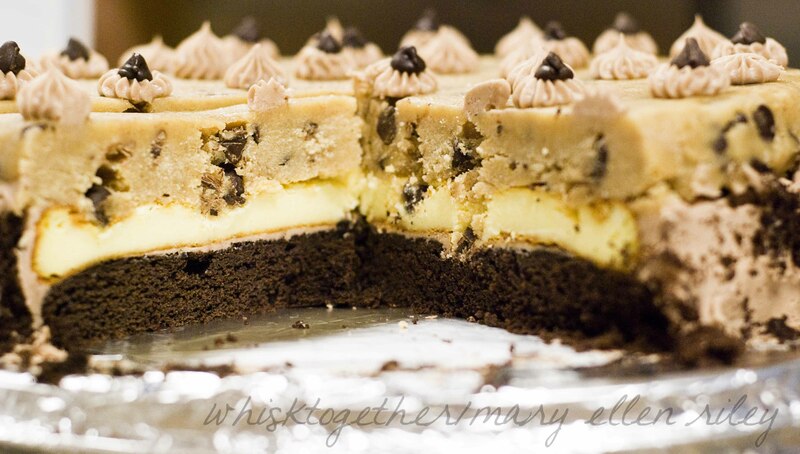 Put the cookie dough layer on top. 5. Frost the sides of the cake. I didn’t frost the pretty cookie dough part, but you can. 6. Crumble the reserved cake crumbs and press them into the sides of the cake. 7. I used a star tip to make dollops on top and then pressed chocolate chips into those. *Speechless* Really. Except for the drool, nothing else is coming out of my mouth. LOL – You crack me up! 🙂 Thank you! Holy cow, your raspberry white chocolate mousse looks soooo good! Thanks for visiting! This looks so amazing! Must think of a reason to make this bad boy….SOON! hey, im abit confused about the cook and serve vanilla pudding part. Do you make the pudding first, before putting in the cream cheese mixture or you just put the vanilla pudding powder in the mixture? You just put the vanilla pudding powder into the mixture. I’m really excited about making this. I was going to start with the cheesecake layer first. I noticed there’s no indication of when to put the cream cheese in. I’ll just assume you do so after the butter and sugar are mixed together. I am so sorry! I try very hard to reread everything. You are right. It does go in pieces after you cream the butter and sugar together. Thank you for letting me know! I have updated the website. Hi my cookie doagh is somewhat dry. I have now frozen the cake. Will it crumble when I take it out of freezer or will it gel by freezing? Also I prepared this cake for a birthday tomorrow. When should I remove it from the freezer so it will be ready for a surprise birthday party? Thank you. Hi! The cookie dough may be dry due too much flour. Measuring using cups versus ounces can make a huge difference in the end product. I would try adding a little more milk maybe just a little at a time until the dough is not dry. It’s hard to tell “how dry” you mean. If it is crumbling now, I would add milk. If it isn’t crumbling, but staying in a cohesive disk of cookie dough, then I would let it stay as is. I have a separate photo on the webpage of just the cookie dough. This cake should go in the fridge the night before the party. Thawing it will take 8-12 hours since it is so dense. Hi! I was thinking of making this for my sister’s birthday. Can I use just any recipe for the cheesecake layer? Does the cookie dough taste good even if it is not baked? ? Oh Yes! It tastes like unbaked cookie dough! We love it.